Harry Potter's Wizarding world just got its newest film and now's a good time to see how the other film in this universe rank up against each other. 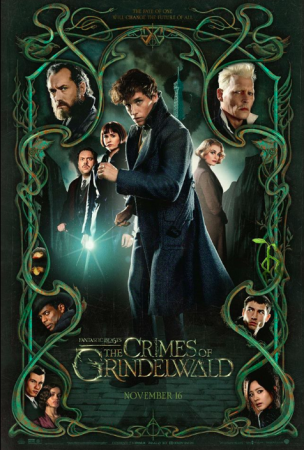 As Fantastic Beasts: The Crimes of Grindelwald hits theatres near you, fans of JK Rowling's Wizarding World across the globe are brimming with excitement. To celebrate the latest franchise, IMDb editors have put together a list of your favourite Harry Potter movies ranked from Magic to plain tragic. Alfonso Cuarón stepped in to direct, introducing the darker tone that would continue through the remainder of the series. But, much like David Yates' later movies, it maintains a sly sense of humour throughout. Weird hairless werewolf aside (we'll forever question that choice), the film is visually stunning, and, as the series moves on, we spend less time watching Harry and friends in class, so it's refreshing to see them in Professor Lupin's class fighting a Boggart, or flying a Hippogriff in Care of Magical Creatures with Hagrid. Ultimately, it's a wonderful bridge between the innocence of the first two movies, and the bleaker storylines that lie ahead. Deathly Hallows: Part 2 is the most cinematic film of the series, but it's also more of a war movie than a Harry Potter movie, which is why we don't have it at No. 1. That being said, it features solid acting across the board, smart pacing that manages to ratchet up the tension without veering into a rushed storyline, and genuinely high stakes. It shows the devastating impact of war not only on the main characters but their family and friends while maintaining an aura of hope throughout. It's the perfect capper to the Harry Potter series and one we'll continue to watch again and again. Half-Blood Prince is the last film where Hogwarts is a key location, and juxtaposing scenes of Quidditch matches, love potions gone awry, and teenage drama with the destruction happening in the larger Wizarding World works wonderfully. We also get more of Helena Bonham Carter's unhinged Bellatrix Lestrange, an intro to Voldemort as a very creepy child, and Tom Felton walking a tightrope of fear and anger as Malfoy. The one major disappointment is Harry and Ginny's relationship. While we try not to compare the films to the books, this version of Harry and Ginny's young love feels rushed, and lacks the chemistry of J.K. Rowling's words. To get the bad out of the way: DUMBLEDORE WOULD HAVE NEVER YELLED AT HARRY ABOUT PUTTING HIS NAME IN THE GOBLET!! Those of you who have read the books know what we're talking about. Outside of angry Dumbledore, Goblet of Fire is definitely worthy of being in the Top 5. It finally shows a glimpse of the Wizarding World outside of the U.K., with both the Triwizard Tournament and Quidditch World Cup providing a new layer to the typical Hogwarts happenings. Plus, we love seeing a pre-Twilight R-Patz. It also sets up the conflict for the remainder of the series, and finally puts a face on He Who Must Not Be Named. Order of the Phoenix introduces us to the style of David Yates, who went on to direct the remainder of the Potter series, as well as Fantastic Beasts. Yates brings in a level of humor to balance out the drama, something J.K. Rowling did so adeptly in the books. He manages to make an angsty Harry still likable, and the lightness and joy he brings to the scenes of Harry teaching "Dumbledore's Army" remind us that amidst all the darkness, magic can still be fun. Professor Umbridge also serves as a great villain, played with aplomb by Imelda Staunton. Phoenix doesn't rank higher because it under-develops the relationship between Harry and Sirius, which ultimately limits the emotional payoff in the end. The first of the five planned Fantastic Beasts movies introduces us to the Wizarding World in a new, more adult light. Plus, Nifflers. The creatures and the supporting players carry the film—most notably Dan Fogler's Muggle sidekick Jacob Kowalski, and Ezra Miller's truly tragic Credence. However, while Eddie Redmayne brings a believable awkwardness to the part, Newt Scamander is no Harry Potter, and the MACUSA wizards are underdeveloped, bureaucratic villains. The twist ending ultimately saves the movie though, teasing some familiar characters going into the second film. The first in the series, Sorcerer's Stone is, let's face it, adorable. Getting to discover the world of magic through a young Harry's eyes is a lovely way to start the series. This film gets credit for the nostalgia it inspires, the John Williams score that has become synonymous with the holiday season, and for setting the stage for the rest of the series. All that being said, while the child actors look the part, their performances leave a lot to be desired. And while it's probably the most family friendly of all the movies, it's also not the one we're going to re-watch on a lazy Sunday. Also known as "Harry Potter Goes Camping," Deathly Hallows: Part 1 suffers from way too much exposition. While there are some satisfying emotional moments, like the trip to Godric's Hollow, the film tries too hard to hit the big plot points, making it feel more like a checklist of moments than a cohesive film. Ultimately, it serves as a nice lead-in for the finale, as opposed to existing as a solid, stand-alone movie. Flying cars aside, Chamber of Secrets lacks some of the je ne sais quoi that makes the other films so appealing. It delivers less nostalgia than the first, less action than the latter half of the series, and ultimately has the thinnest storyline.